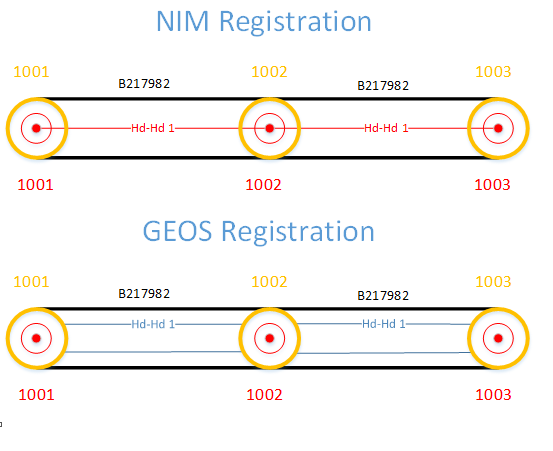 Fiber Cables are only registred in NIM, not in GEOS FOW. To enable better management of Fiber assets, registration of Fiber Cables need to be moved from NIM to GEOS FOW. 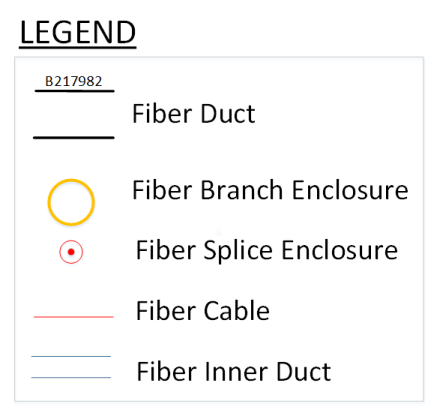 Fiber Branch- and Fiber Splice Enclosures have an asset-id which is a number like ‘1001’ Fiber Cables have a name like ‘Hd-Hd 1’. This name is also maintained with Fiber Inner Ducts in NIM and is used to put Fiber Cables from NIM into the right Fiber Inner Duct in GEOS FOW. In the current GEOS FOW system where there are no Fiber Cables (yet) present, this looks like this. The Fiber Inner Ducts with the Fiber Cable name on it are indicated in red and are contained in a Duct. You can also see that the ‘Contains’-node of the Fiber Inner Ducts do not have a value, but this is where migrated Fiber Cables will appear. When all these assets are registered correctly, Fiber Cables can be migrated from NIM to FOW. Both systems NIM and GEOS FOW are running for several years so mismatches between the 2 systems exists and not all Fiber Cables can be migrated correctly. To analyze and visualize the quality of migration, Ad-Hoc queries play an important role. 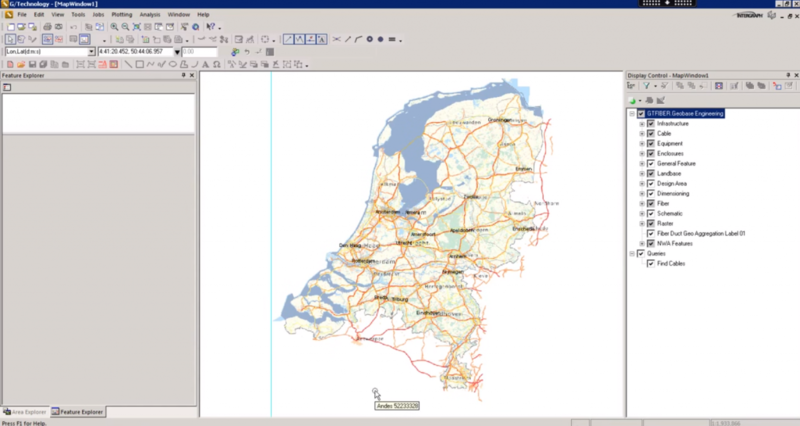 The Query Name is added to the ‘Queries’-node in the Legend and the extends of the Netherlands is shown. The query has run successful, and there are many Fiber Inner Ducts without a Fiber Cable in it but we cannot really see them without turning off all the items in the legend and then zooming in into one of the items of the resultset. The necessary keys g3e_fno, g3e_cno & g3e_cid are still present but are now created using hardcoded value instead of SQL-joins, only the value for g3e_fid is variable but is now fetched from GC_CONTAIN. In this approach, table GC_FDUCT_L is no longer required. This first queries showed we have some problems with our data migration, but the results are not really in a readable format. If you have a query with multiple results like this one, it may be convenient to output the results to a Datatable. Note: If your result set is very large, it is better to export your results using a dedicated SQL-tool. 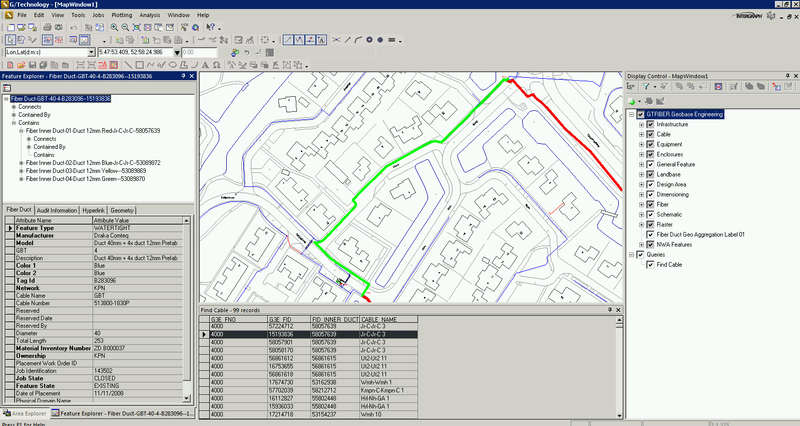 The SDO_GEOM.RELATE Oracle Spatial operator is used in the where clause to get all the Fiber Ducts contained in area ‘Hd-C’. Click here for a Video of creating and running this Query. 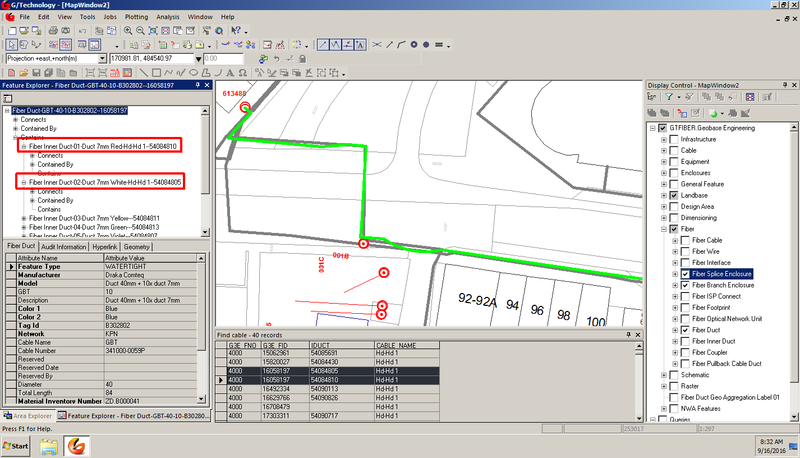 This entry was posted in G/Technology, Intergraph and tagged FOW, G/Technology, Telecom. Bookmark the permalink.